The Procharger stage II Kit uses an 8 rib belt driven off a dedicated crankshaft pulley. 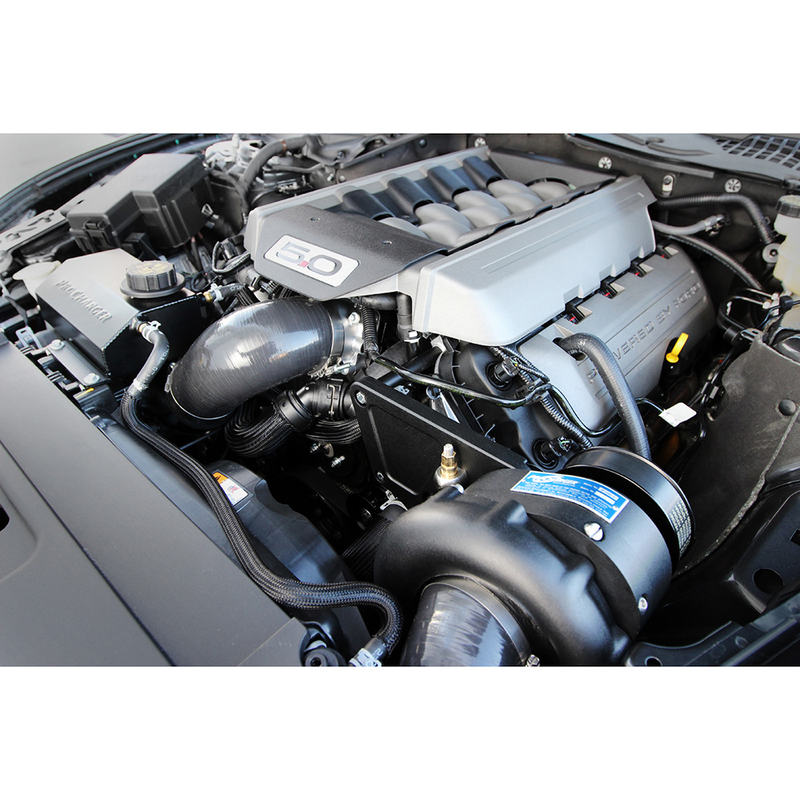 Building on a 20-year history of forced induction engineering and innovation, ProCharger is the first centrifugal supercharger manufacturer to design and release a highly efficient air-to-air intercooled supercharger system for the 2015-2016 Mustang GT. With an original billet aluminum bracket design and compact belt-drive system, ProCharger P-1SC-1 intercooled systems and tuner kits continue to lead the industry in OEM-style fit and finish, ease of installation, and reliable performance. The Procharger stage II Kit uses an 8 rib belt driven off a dedicated crankshaft pulley, compared to the shared 6 rib drive of the HO system. This dedicated belt system is designed to support up to he 1,225 HP+ capable F-1R headunit. Now just because the word “racing” is being used, do NOT think this Stage 2 system is something that will have you trimming/drilling/cutting into your car. This system is 100% reversible, same as the HO system. Thats right, even a kit that supports up to 1,225+ HP doesn’t require any permanent vehicle modifications. ProCharger knows that these systems will be used for high HP racing applications that dictate a rock-solid crank pulley design. Using a patented design, we are able to adapt a 8" supercharger drive pulley onto the factory harmonic balancer, without having to drill or modify any factory parts. (balancers are already pinned from the factory). The ProCharger crank pulley works by using a system of “cam-locks” to securely grip the factory balancer, taking the load off the crank bolt, and ensuring years of service without worry. Combining this 8" crank pulley with a HD tensioner near the supercharger pulley, the system was designed for maximum belt wrap. Having a dedicated belt for the supercharger means less belt stretch. (AKA MORE tension and traction) Having a dedicated belt also gives the added bonus of being able to quickly remove the supercharger belt. After removing the supercharger belt all other functions of the car will remain the same, and still drivable. Even with the best belt wrap possible the tensioner system still needs to be up to the task of holding drive power without slippage. ProCharger’s tensioner is unique in design in that its not only spring loaded, but also allows the customer to add as much pre-load adjustment as they want into the belt. This tensioner has already been proven to support high HP racing applications with dedicated 8 rib belts, ensuring a solid grip for those with elevated boost and power levels. You can also change the pulley and 8-rib belt without removing the bracket or the supercharger. Making for quick and easy boost changes at the track or in your garage. ProCharger’s massive 2015-2017 Mustang Air-to-Air intercoolers make a huge visual statement, and have the performance to back it up. The 2015-2016 Mustang HO intercooler has already been tested to support over 800HP due to its highly effective 630 cubic inch core. While the Stage 2 intercooler increases its cooling core size by a mind blowing 75%, while still fitting behind the factory bumper without cutting/drilling/trimming any factory parts. For those of you that are the “DIY type” doing installations in your home garage. The ProCharger Stage 2 system comes with a handheld programmer from Diablosport with a supplied ECU tune for the supercharger. ProCharger has spent countless hours on the Dyno/Street to not only deliver you a high horsepower tune, but also making sure to retain reliability. With long-term reliability in mind, these tunes are set up from ProCharger to account for fuel variations across the country. Custom tuning may result in more power, however is not required. 2015 2016 2017 Ford Mustang 5.0L Coyote S550 Roush Saleen & Steeda Vehicles.